If you think all I have done this weekend is craft, then you would be correct! lol Having made my first easel card yesterday I thought I would experiment with a "twisted" easel card today. Am quite chuffed with the result. 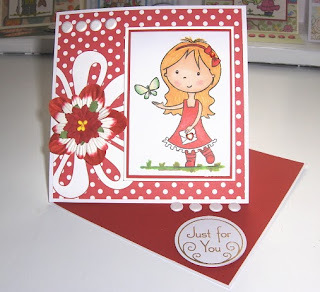 I used another of my new Wild Rose clear stamps which I coloured in with my Promarkers. (Think my colouring-in technique needs a bit of help so can feel another Bee Crafty tutorial coming on!) The image was matted onto some red and then white card stock and then placed onto some red/white dotty paper that had a large white flower already on it. I then used some Bee Crafty blooms to create a flower which I glued into the centre of the large white flower. I added a heart shaped red gem to the letter and a round red gem to the hair band for added interest. As ever finished off with white card candy and a sentiment.